Though our UK manufacturing facility we can design a range of cushions and parasols to suit your requirements. Any shape, any size, we make to order so whether you require deep seating for your decking, pads for a coffee shop or parasols for you restaurant we can help. We offer various filling options from Fibre to Foam & Reflex. Depending upon your requirements and end use we can suggest the right filling for you. The Reflex range of foams offers optimum performance with minimum maintenance; the foam consistently retainsgood cushion shape. The Reflex foam used has a hardness of 115-150 Newtons and the density is 27-29 Kgs per cubic metre. The classification is S (Severe) which equates to use in commercial and domestic seats, public transport backs and armrests and contract furniture backs and armrests. All reflex foams are melamine additive free, providing good longevity. We have the facility to screen print your logo, company name or artwork onto both cushions and parasols. We have metal, wood and aluminium frames in a huge range of colours and sizes. See chart below for more information. 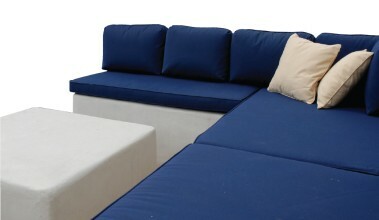 We use both Sunbrella and Agua outdoor fabrics for commercial cushions. To request a swatch book displaying the available fabric designs please contact our sales department.